Fig.1 Major Kingdoms of South India 1320 CE. 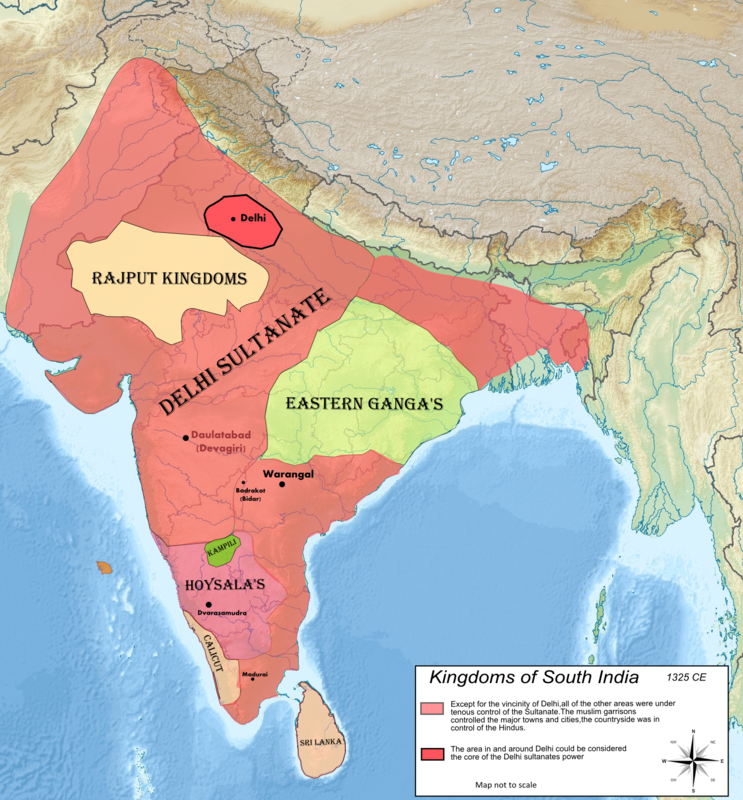 The map above shows the rough extent of the Delhi Sultanate and the extent of the major South Indian kingdoms. In Delhi tectonic changes were taking place. In 1320 CE, Khusrau Khan assassinated Sultan Mubarak Khilji and proclaimed himself Sultan Nasir-ud-din. From the venom heaped upon him by Muslim historians like Barni, it is clear that Khusrau Khan had converted back to Hinduism. Khusrau Khan is an enigmatic character who deserves an article on his own; I will touch very briefly on him. Assisting Khusrau Khan in reasserting Hindu might in Delhi were fifty thousand Gujarati Hindus who had been enslaved by Ala-ud-din Khilji during his conquest of Gujarat. These are the Parwárís referred to by Muslim historians. But this joy was short lived.Khusrau Khan was defeated in battle by Ghiyath-al-din Tughlaq and excecuted .Devala Devi who had married Khusrau Khan committed suicide by taking poison. After killing Khusrau, Ghiyath-al-din Tughlaq took over the reins of the Delhi Sultanate in 1320 CE. Once the Gangetic plains were subdued, he was able to direct his attentions to the south which had shaken off even nominal allegiance to the sultanate. Taking advantage of the chaos in Delhi, Prataparudra had thrown off the Muslim yoke. It is apparent that all the previous Muslim expeditions had not dented Warangal’s power much. Once the gangetic plains were subdued, Ghiyath-al-din Tughlaq turned his attention onto Deccan and further down south. Mubarak Khilji had completely wiped out the Yadava ruling family in Devagiri, which was now completely subdued. As mentioned previously Devagiri had become a stronghold of Muslims, who were encouraged to come and settle. Keeping in line with the genocidal policies of the sultans, Hindus were pushed to bare subsistence levels wherever the Muslims gained a strong foothold. A detailed explanation of the economic and social catastrophe that befell Hindu society can be found on Dikgaj’s blog (http://dikgaj.wordpress.com/). Ghiyath-al-din Tughlaq sensed that Warangal would not be easy to subdue. For this purpose a large army was assembled from the Muslim strongholds of Baduan, Oudh, Kara, Dabmu, Bangarmu, Chanderi etc. This sea of Muslim armies marched towards Warangal in 1321 CE led by Ulugh Khan (later on known as Mohammed Tughlaq). This expedition was clearly with a view of conquering the Kakatiya kingdom, not just looting it. Ulugh Khan was accompanied by a host of other nobles and their retinues. After two months they reached Deogiri, where they were reinforced by other Muslim amirs and the invasion force rolled on towards Warangal. At this point it needs to be appreciated that this was the third full scale invasion of Warangal in a short time of eleven years. Muslims could generate and sustain massive armies on the back of relentless exploitation of the Hindus of the north and the looting of existing Hindu kingdoms. The enslavement of Hindu men and women was big business for the Delhi sultans. Northern India (Punjab and Gangetic plains) was stripped bare of resources after being raped for over three centuries by the Muslims. On the other hand the Kakatiya kingdom was hard pressed to generate the same level of military resource without adversely affecting other sections of society i.e. agriculture, trades etc. Despite their obvious resource handicap the hardy Kakatiya warriors put up a fierce fight to the advancing Muslim host. As on previous occasions Prataparudra along with his nobles took shelter in the formidable Warangal fort. Prataparudra was well prepared to withstand a long siege. In any event the siege dragged on for eight months. Roving bands of Kakatiya warriors disrupted the Muslim postal system and harassed the invaders from the rear. 1. Mounted Couriers: The first type was mounted couriers on horses. There were relays every 4 miles. 2. Runners on foot: – Every third of a mile there was a village outside which three pavilions in which runners sat ready to move off. Each runner had a staff (yard and half long) with bells at the top. When a runner ran he had the message in the fingers of the free hand and the rod in the other. The bells alerted the men sitting in the next village of the runners approach and someone in the next pavilion took over the message. As per Ibn Battuta this was faster than mounted couriers. Fruits and criminals were also transported in this way to the sultan. This seems to have been only used for the sultan’s personal needs/military communications/government communications. While the siege of Warangal was in progress, dissensions and intrigues broke out in the Muslim camp. Distrustful of Ulugh Khans motives, a group of rebels led by Tighin and Timur conducted secret negotiations with Prataparudra. As per their pact with Prataparudra, the rebels would abandon the camp and lift the siege of Warangal, provided Prataparudra allowed them to leave unmolested through his territory. Once assured of their safety the rebel faction rolled up their camp, destroyed the wooden stockades and left Ulugh Khan to face the wrath of the Kakatiya forces. As soon as Prataparudra was sure that the rebels had left the Muslim camp for good, a ferocious sally issued forth from Warangal fort. This caused great slaughter in Ulugh Khans camp. Ulugh Khan had to depart in haste, all the while being pursued by the avenging Hindus. Thus ended the fifth invasion of Warangal in total ignominy for the “ever victorious” armies of Islam. Within six months a more formidable invasion force was raised and Ulugh Khan swept into the Deccan. This time Prataparudra was taken unawares and was completely unprepared for the attack! It is difficult to explain this failure in the light of the fact that on every previous occasion he had been well prepared to meet the Muslim attack. The Kakatiya soldiers had been sent back to their villages and the granaries emptied, even Warangal fort was not properly provisioned. This can be only described in that oft repeated phrase of modern India as an “intelligence failure”!! The Muslim force stormed Badrakot (Bidar) and besieged Warangal. The siege went on for five long months, but the breaking point for the brave Hindus came due to lack of food within the fort. Prataparudra surrendered on condition of amnesty. While being taken as a prisoner to Delhi, Prataparudra committed suicide. Rather death than a life of dishonour!! This is a message strangely lost on modern India wherein “compromise” and “adjustment” are the buzz phrases of the secular mob. Thus fell the great Kakatiya kingdom which was a focal point of Hindu resistance against Islamic imperialism for nearly a quarter of a century. Ulugh Khan promptly renamed Warangal as Sultanpur. A typical act of Islamic vandalism wherein anything created by other cultures is appropriated as their own!! Ishwa from India forum has written a nice series of articles analysing Islamic vandalism (http://www.india-forum.com/forums/index.php?/topic/2468-scheme-of-muslim-rule-in-india/page__pid__108412__st__0&#entry108412). Myths like the golden age of Islamic science etc which are being bandied about these days are a pretty good example of gross distortion of history. Although Prataparudra’s death brought the curtains down on the Kakatiya kingdom it did not extinguish Hindu resistance. In south western Andhra, Jagatapi Gangayadeva resisted the Muslims from his capital at Gutti. But in due course he was forced to submit to Ulugh Khan. Fighting continued in the coastal Andhra region. Ulugh Khan established his authority and extracted tribute from the Hindu populace with the help of Muslim governors and the usual Hindu collaborators. Ulugh Khan also retained the key decision makers of the old Kakatiya kingdom to help govern the newly captured province. What limited freedom of movement the old Hindu officials had, would be closely watched by strong Muslim garrisons posted in key cities. After the fall of Andhra, Ulugh Khan captured Madurai. In 1323 CE, Parakaramdeva the Pandya king of Madurai was defeated and his family taken prisoner. A strong Muslim garrison was posted at Madurai and the administration passed into the hands of Muslim amirs. In 1325 CE, Sultan Ghiyath-al-din Tughlaq was killed when a wooden structure erected to welcome him from his Bengal expedition collapsed on his head. The hand of Ulugh Khan in his father’s death has been strongly suspected by historians. With this Ulugh Khan ascended the throne of Delhi and proclaimed himself Sultan Mohammed Tughlaq. South: Kampili (Karnataka), Dvarasamudram (major portion of Karnataka, parts of Andhra & parts of Tamil Nadu), Kandhyana (present day Pune region, not shown on map), Calicut. East: Jajnagar (Orissa), Kamarupa (Assam, not shown on map). The map above gives a rough idea of the size and location of the remaining Hindu kingdoms in the south of India. I make no claims to the accuracy of the map; hence take it as a rough guide. Its one thing if kafir Hindus are cut down like animals, but a different thing if a “true believer” i.e. a Muslim is killed!! In recent times the secular lobby has tried to rehabilitate Mohammed Tughlaq by portraying him as a misunderstood visionary who was ahead of his time! The same “eminent historians” are responsible for this reprehensible whitewash. On a side note many of these pseudo historians testified from the Muslim side in the Sri Ram Janmabhoomi court case which was decided recently upon by Allahabad High court. The way the Honourable judges tore apart their lies can be found in the extracts of the judgement posted in this thread in Bharat Rakshak (http://forums.bharat-rakshak.com/viewtopic.php?f=1&t=5697). In the above poassage, Barani is talking about the atrocious taxes levied by Mohammed Tughlaq and their effect on the Hindus of Uttar Pradesh. So the “enlightened” Sultan first taxes Hindus till they have virtually no incentive to till their fields (It must be kept in mind that even in this day, land is everything to the Indian farmer.He will only abandon it in the most extreme circumstances: either when it does not provide even subsistence level food or under extreme force by external factors).Next when the Hindus flee inhuman persecution,the Sultan promptly organizes “shikaars” and hunts them down like wild animals!! Kampili was a small but powerful kingdom founded by Mummadi Singeya from the fragments of the disintegrating Devagiri kingdom. Kampilideva succeeded Mummadi Singeya in 1313 CE. Please see the map for a rough idea of the kingdom of Kampili. It was tiny compared to the Delhi sultanate, but it punched well above its weight. It took three well equipped invasions before Kampili faded into the night. Kampilideva is one of those unacknowledged heroes of our history who fought tooth and nail against the Muslim invaders. A staunch defender of dharma, he fought with even those Hindu chiefs who paid tribute to the Delhi sultans. Kampilideva fought many battles with bigger kingdoms such as Dvarasamudram and Warangal. Mohammed Tughlaq decided to put an end to Kampili before it became the focal point of resurgent Hindu power in the Deccan. An ideal pretext for invasion was found in Baha-ud-din Garhasp’s rebellion. Baha-ud-din was a cousin of Mohammed Tughlaq and had been made governor of the Sagar town (Karnataka) by Ghiyath-al-din Tughlaq .A brave warrior; he had fought with distinction against the Mongols in 1324 CE. Baha-ud-din was disaffected with his treatment by Mohammed Tughlaq and rebelled in order to carve a separate kingdom for himself. All this while, he had been careful to cultivate excellent relations with Kampilideva. In 1327 CE, a pitched battle between the Delhi sultanates army and Baha-ud-din took place on the banks of the Godavari River in Karnataka. Garhasp was defeated and fled with his family to Kampilideva for protection. Like on previous occasions in our history, the flight of a fugitive to the protection of a Hindu state was enough excuse for the Muslim sultans to attack the Hindu kingdoms. In Kampili’s case the excuse came in the form of Baha-ud-din Garhasp. I have taken the descriptions of the three invasions straight from N Venkataramanayya’s book. Apologies if it sounds ad verbatim, as for most part it is. The first invasion of Kampili took place shortly after Garhasp’s rebellion in 1327 CE. Malik Zada aided by Malik Rukn- ud- din crossed the Krishna and mounted an attack on Kummata, which was the chief fortress of Kampilideva. At this time, Kampilideva was in his capital Hosdurg (Anegondi). Kampilideva sent a strong force headed by his minister Baicappa, his sons Ramanatha and Katanna, and Garhasp to reinforce Kummata. On arrival Rukn- ud- din pitched his tents around the fort. Katanna conducted a surprise sally from the fort on the first day of the siege, inflicting heavy losses on the Muslims and capturing two thousand horses in the process. The next day the Muslims tried to storm the fort but were decisively beaten back by Ramanatha and Katanna. The Muslim army was completely routed and Rukn-ud- din forced to retreat back to Devagiri. Thus ended the first invasion of Kampili; a complete failure for the world conquering armies of Islam. Incensed by the failure of the “mighty” armies of Islam to subdue the small kingdom of Kampili, Mohammed Tughlaq promptly despatched another well equipped invasion force under Malik Qutb-ul-Mulk. The Muslims moved as before to attack Kummata. Kampilideva was well prepared to meet the second invasion as well. Both the forts of Kummata and Hosdurg were strengthened. This time Kampilideva himself led the defence of Kummata against the Muslims. On the night of first day of the siege a surprise night attack by a band of Kampili warriors threw the Muslim camp into confusion. On the second day Qutb-ul-Mulk attacked the fort with all his forces from three sides. They managed to take the outer wall, but were pushed out by the vigorous defenders led by Kampilideva. On the third day of the siege Kampilideva arranged his troops in battle order outside the fort gates. Facing him was the Muslim army with their Turkish horse archers in the centre, cavalry to the right and elephants to the left. Ramanatha attacked the Turkish centre first throwing them into disarray. As they desperately tried to flee from the attack, they caused confusion in the cavalry and elephants stationed on their sides. Ramanatha charged the Muslim forces cutting most of them down and killing their top commanders. Qutb-ul-Mulk saved himself by escaping from the battlefield. Within a short time Mohammed Tughlaq despatched an even larger force under his minister Malik Zada. There seems to have been a drought during this time in Kampili, as the Portuguese historian Nunes says that the Muslims had to wait for the rainy season before they could proceed further. This would perhaps explain why the two strong forts: Kummata and Hosdurg ran out of provisions relatively quickly. The Muslims laid siege to Kummata first. Although Kampilideva and Garhasp sallied forth and assaulted the Muslims, they were defeated and forced to pull back inside the fort. Conditions inside Kummata got dire as the Hindus began to run out of provisions. The Muslims stormed the fort in an all out assault forcing Kampilideva to abandon Kummata and seek shelter in his capital Hosdurg. Kampilideva relocated the fifty thousand citizens of Hosdurg to other places in Kampila, only keeping five thousand soldiers for the defence of Hosdurg. Hot on Kampilideva’s trail, Malik Zada laid siege to Hosdurg. After one month the situation inside the fort got dire. The situation got even more precarious when the Muslims stormed their way into the fort. Kampilideva realised all was lost, but this great man first made sure his friend Garhasp escaped with his family to the Hoysala kingdom of Dvarasamudra, which was ruled by Veera Ballala III. Garhasp escaped with his family to Dvarasamudra. (Garhasp seems to have been quite an accomplished warrior, as he is described tying three-four horses together, putting his family on them and riding out of Kummata, only turning back to cut down his pursuers). I am quoting this passage written by Ibn Battuta about the last hours of this great sovereign. It is extremely stirring to read, “Then he (Kampilideva) commanded a great fire to be prepared and lighted. Then he burned his furniture, and said to his wives and daughters, “I am going to die, and such of you as prefer it, do the same.” Then it was seen that each one of these women washed herself, rubbed her body with sandal-wood, kissed the ground before the ráí(Raya) of Kambíla (Kampila), and threw herself upon the pile. All perished. The wives of his nobles, ministers, and chief men imitated them, and other women also did the same. The ráí, in his turn, washed, rubbed himself with sandal, and took his arms, but did not put on his breastplate. Those of his men who resolved to die with him followed his example. They sallied forth to meet the troops of the Sultán, and fought till every one of them fell dead.” (Batuta). As can be seen from the above passage the ladies of Kampila performed “jauhar” to save their honour. Ibn Batuta heard about this incident from a trusted source, but he was an eye witness to another incident wherein the Hindu ladies burnt themselves on their husband’s pyre. Ibn Batuta clearly describes their fearlessness and devotion to their husbands in the face of the raging flames. Kampilideva fought extremely bravely in battle before falling dead of his many wounds. Malik Zada had his head stuffed and sent to Mohammed Tughlaq as a gift. The Muslims conducted a general massacre of the remaining residents of Hosdurg. Those who survived like the eleven sons of Kampilideva; were converted to Islam. Thus was the end of the kingdom of Kampili, but the lowest ebb for the Southern Hindus was yet to come. What of Baha-ud-din Garhasp? Veera Ballala III was unwilling to take the risk of inviting a full scale Muslim invasion by sheltering a fugitive. He promptly handed over Garhasp to Malik Zada. ii. Ibn Battuta, Travels in Asia and Africa 1325-1354; HAR Gibb; George Routledge & Sons, 1929.